Patrick Dempsey is a race car driver, a racing team co-owner and a three-time veteran of the 24 Hours of Le Mans. While celebrities periodically appear like comets on the international motorsport stage, the daunting realities of competition, combined with the time, financial and travel commitments, and inherent risks of the sport soon dissuade most. It is here where Dempsey takes the path rarely trod, not dissuaded, but rather, fully committed. “When I grow up I want to be a race car driver,” said Dempsey. It is tough for some tender Hollywood egos to accept that in racing, talent is objectively measured. Once the helmet goes on, stars become anonymous drivers whose performances are measured by data feeds and timing and scoring screens. “Patrick is a fantastic student because he takes direction for a living. He’ll always do what you ask,” said Joe Foster, his racing coach and co-owner of Dempsey Racing. As Foster sees it, the challenge now is the level of competition has grown as well, at the same time it’s much more difficult to be competitive. “The closer you get to the top, the harder you have to try. It’s like an asymptote in math, the closer you get to the line, the further up the other line goes. Patrick’s got to push, push, push that much harder to get the last few tenths of a second,” said Foster. As Foster sees it, Dempsey has progressed to a point where it is now simply a question of time and more sponsorship money to get him that last little bit of lap time. “He’s quite close,” said Foster, who began working with Dempsey in 2007. The team has made strong runs for GTE-Am class honors at the 24 Hours of Le Mans in each of the past two seasons, finishing fourth in 2013 and fifth this past June, while leading the class at various stages in both years. More recently, Dempsey decided to swim with the racing sharks, entering the mega-competitive Porsche Supercup at Germany’s Hockenheimring. The races are flat-out sprints. There are no pit stops. There are no co-drivers. A Sportsmen driver like Dempsey, who is teamed with Georgia’s Andrew Davis, are paired with pros aboard specially prepared Porsche 911, Audi R8, Ferrari 458, BMW Z4, Aston Martin V12 Vantage and Dodge Viper entries. With top teams like Alex Job Racing, Magnus Racing, Snow Racing, Paul Miler Racing, GB Autosport, Park Place, Riley Motorsports, Flying Lizard, Fall-Line Motorsports, Turner, TRG-AMR, AIM Autosports and Scuderia Corse the entry list reflects the quality, depth and experience in the field. On the driver side, there are familiar top shoes like Marino Franchitti, Townsend Bell, Jeroen Bleekemolen, Damien Faulkner, Andy Lally, Leh Keen and Spencer Pumpelly. The races are often see the gentlemen drivers who in many cases provided key funding, start, then give way to the pros after the starters have met their minimum drive time. Since the cars and the pro drivers are all fairly equal, pit stops, race strategy and the performance of the sportsmen relative to their direct competition frequently determine the outcome of the race. 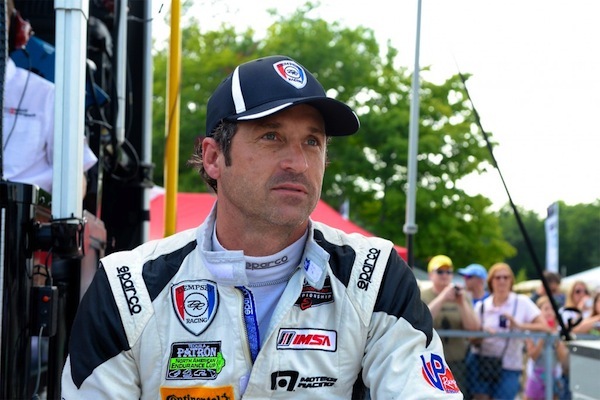 And as he gains experience and whittles away on his lap times, the competition and fans can clearly see that Patrick Dempsey is growing up as a race car driver.